Cold days and nights call for warm dinner ideas! 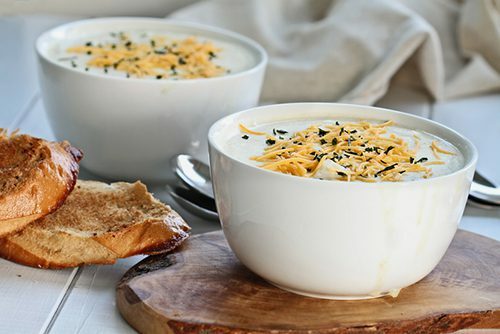 Try this light, yet creamy, potato and cauliflower soup that has a deep flavor and fewer calories than other potato soups. Peel and chop potatoes; shred carrots and dice mushrooms. Place all veggies in a large pot (including the cauliflower florets). Add enough water to cover the veggies and bring to a boil. Cook until veggies have become tender; approximately 10 minutes. Add 2-3 cups of the potatoes, carrots, cauliflower and mushrooms to a blender; blend until smooth, adding cooking liquid as needed. Set aside. Slice green onions and mince garlic. Heat a large saucepan over medium and add butter. Once butter is melted, add onions, garlic, salt, pepper, and onion powder; mix to combine. Continue to cook over medium heat, until onions have softened. 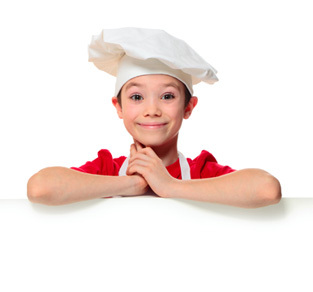 Add flour and stir continuously until thick and bubbly. Then add the milk and broth very slowly until it forms a thick white sauce. Pour pureed vegetables into the white sauce and then add the rest of the cooked veggies. Stir to combine. Add cheese and stir into the soup. Serve warm.